Yum, Yum, Yum! I’m not really a sandwich person. I usually feel like they have too much bread for my taste. But I wasn’t sure what to make for dinner and had some yummy roasted garlic bread to use up. So I decided to combine some of my favorite food ingredients with our turkey lunchmeat to make a sandwich I thought I’d like. It worked so well I made another to bring for lunch the next day. Eric really loved this. He’s a sandwich fan and was so excited. It was delicious on the roasted garlic bread, but also great on toasted sandwich bread. If you want it heated all the way through you could put it in the oven. You could also use a George Foreman grill instead of the stove, but I didn’t want to get it out of the back of the cupboard. 🙂 I also made Herb Potato Wedges and mixed ketchup and mustard for dipping them. I made the wedges first and by the time the sandwiches were done, they were ready. Sautee peppers, onions and garlic in olive oil until starting to soften. Add balsamic vinegar and continue cooking on low for another minute or two. Use the crusty parts of the bread for the top slices of your sandwiches. Butter the underside of the bottom slice. Top with some of the pepper/onion mixture. Sprinkle on crumbled feta, pressing into place. Layer on turkey and tomato slices. Spread mustard on underside of top slice and place on sandwich. Heat a skillet on medium high and place sandwich (buttered side down) in the skillet. 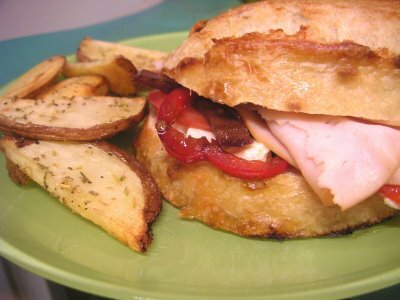 Use the bottom of another skillet or pot to press down on the top of the sandwich. Press it several times for about 3 minutes until bottom is nicely toasted. Cut each potato in half and then cut each half into 5-7 wedges. Drizzle with olive oil and toss to coat well. Sprinkle with garlic powder and italian seasoning. Spread out on a foil lined cookie sheet. Bake about 20 minutes or until golden and crispy on the outside, soft on the inside. Totally! Sometimes I crave french fries, and maybe once a year get a small one from McDonald’s and end up feeling so sick. But oven fries never do that to me.